Industrial solutions for the health sector are a major issue. In buildings such as hospitals, that these solutions function well is not only a matter of comfort, but of health. This was the case at Farah Hospital, located in Amman (Jordan), which is considered the biggest and most prestigious hospital in the Middle East. During the construction of an extension building in 2012, they faced the necessity of state of the art cooling and heating technologies that would help them reduce energy consumption, especially the oil consumption. At Araner, we designed, manufactured and implemented based in the use of Thermal Energy Storage (TES) tank and heat pumps, which not only helped Farah Hospital accomplish their goals, but also helped the company save up to 581,100 USD per year in fossil fuel. Download the full case study for free and learn all the details. They had to develop an environmentally friendly building to qualify for the Leed Certification for Green Buildings. Araner offered Farah Hospital a tailor-made solution which managed to solve infrastructural issues, including a restriction on the space required to accommodate the TES Tank. With our help, they were able to achieve their goals in terms of energy savings and operational cost reduction. A Thermal Energy Storage (TES) tank is a naturally stratified thermal accumulator that allows the storage of chilled water produced during off-peak time. A TES tank reduces the operational cost and the required capacity of the cooling plant. One of its advantages is the production of cold water when energy demand is low using the excess power generation, which usually takes place during the night when the ambient temperature is low and coolers can perform with better efficiency. 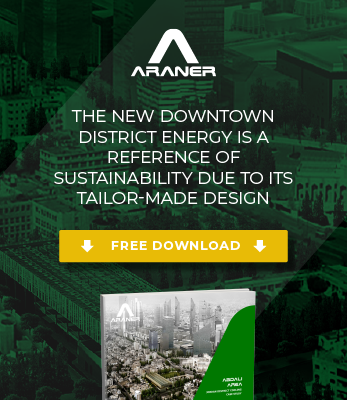 Araner is not only the leading company in Turbine Inlet Air Cooling and innovative District Cooling Solutions, but has also designed and implemented some of the world’s biggest Thermal Energy Storage Systems. Just as we did with Farah Hospital, we take on each Thermal Energy Storage project from a unique perspective, and strive to provide each client with tailor-made solutions that will best suit their requests. Contact us for further information.